>> It goes like this... Following the Indian civil war, the Spades were forced to leave their firstborn, Jonathan, with a family of friendly Indians because someone may have been after them. They went to work at an inventor's company named Paradise Works in London, and raising their two other sons there, William J. and the youngest, Virgil, but were killed by unknown hands before they could retrieve him. He was raised by the Indian mystics until his early adulthood, when the family was wiped out mysteriously. Finding them dead when he returned from a school trip, he traveled the Commonwealth looking for his real family, and becoming a fair security's man in the process. Eventually, he found Paradise Works and his two brothers. By then, having grown up without their parents for most of their lives, the somewhat badly adapted William J. had become an engineer working on his father's early designs and Virgil, calling himself "The Ace", became a somewhat rude test pilot and ne'er-do-well. Jonathan's goal thus became to reunite his family and keep his brothers out of trouble. Previously... When Simone Lorcquet came to town, she shook things up, and not just with her singing at the Parlour. All three brothers found her interesting though it would be Ace who would court her more actively. Not that it was all fun and games! Ace had to deal with a rather untrustworthy mechanic by the name of Oily Pete, and Jonathan had to contend with the racist Scotland Yard inspector Vaugnharvey. And what of Jeremiah Dark, whose Dark Company had a hand in many patents and knew their parents, and seemed to be hiding something? It sometimes seemed like their only friends were the owner Thaddeus Thorndike, who was a friend of their parents, and young Jesse Waylons, Johnny's steamcomics-addicted deputy. They were never able to prove that Dark was behind the theft of multiple convoys bringing precious metals to London by outlaws wearing yellow masks, and when the supplies ran too low, the brothers went (not all voluntarily) to Africa's minerally rich hidden valley of Togo to trade for some. After some native tribal challenges, they had the stuff, including an old Bible and a dagger with a strange inscription. This clue led the brothers on a quest to find its owner, a rogue archaeologist who may have stolen and hidden a gem of great value. But before they follow up on it, the tribesmen that helped them now attack their caravan because they've fallen victim to a disease from something traded to them. The convoy is defended, and in the process, Ace makes friends with one of Oily Pete's crew, sympathetic Jimmy "Da Gun". Now following their leads, they travel to a number of countries, all the while disturbed by dreams of apes come to revenge themselves on the owners of weapons used to kill the tribesmen. The gem will be found in a Romanian cemetary, and it allows the brothers to at least pay off Ace's gambling debts. On this trip, they meet Lupita, an explosives smuggler Johnny wants to bring to justice, but she gets away (without her merchandise). William J. seems interested in her, but he kinda smells, you know? Back home, Ace decides he'll go to Dover soon to compete in a steam-mech exhibition, and then there's another attack on a convoy. 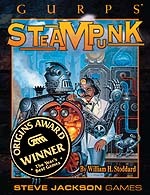 Johnny goes out to stop them and his own steam-mech runs out of steam and isn't able to help. Deep questions as to the effects of a first Shift are explored, but no answers come up. Investigations into the convoy hijackings turn up nothing even with the help of Madame Zuzu, an old Indian soothsayer known by Johnny. When Oily Pete forbids Ace to take his mech to Dover, Ace does so anyway, but still gets his arse kicked by mystery pilot Lupita who may be cheating with unknown technology. The event will end in a puff of smoke when a vehicle crashes into another, gravely injuring Simone and Dark, the latter of which pulls through rather easily. The brothers visit Simone in the hospital and again mystified by a Shift, they try to collect their wits before they are sent on an expedition into the Welsh countryside to survey for a coal deposit. On the way, they find a clue to the identity of the convoy hijackers - a yellow ribbon that Johnny has a strong feeling about in conjunction with Dark...? The brothers come across a damaged automaton that attacks them, and which they must neutralize. Following its steps leads to a house in which they find a peculiar invention left by the engineer whose automaton malfunctioned! As they reach the surface with their prize, they learn via the newspaper that a bomb has exploded in the already sick hidden valley, and destroyed it completely. Upon their return to the Works, it is attacked by giant wolves, and Dark claims someone has earned the ire of a rival company who does inbreeding experiments. The brothers are sent to make amends since it may be them. They find the true culprits, a company on the other side of town. They also discover that they are working with Dark and are most probably the hijackers that have made their lives difficult. They beat the bad guys, but also confront Dark, who shows his hand by admiting he killed their parents, as well as hinting that he too, shifts. The confrontation turns violent as Dark squares off against the brothers in his elephant-mecha. Big Ben is badly damaged in the battle, sending the city into martial law, and then Dark is finally killed in a blast of smoke. His body is not recovered after it fell into the London underground. Through this, Paradise Works gets wind of a secret plan by the Dark Company's holdings to kidnap hotel patrons for their brain matter to make biocomputer circuits. Investigating, Johnny is kidnapped as well. He's rescued, of course, and Thornedike approves an attack on the far side of the moon, where Dark's secret base is apparently set up, an attack and rescue, as it turns out, using their new lunar cannon. Recently... blimp for the New World, but leaves his brothers their parents' journal, in which they find mentions of possible shifting on their parts too, as well as examples of a strange language that never changes from shift to shift. Attending Oily Pete's funeral, Ace is challenged to a duel by Pete's brother Greasy Gil. It will end badly for Gil, who gets his ear ripped off and falls off a bridge. Meanwhile, Ace can't see Simone because her father Horace Lorcquet has come to town to see what kind of decadent life she's leading and doesn't approve. Thornedike is later murdered and Vaughnharvey asks the brothers for help in the investigation. They find that he didn't want to do business with dangerous supporters of the Boer war, and they had him killed. Johnny and Ace eventually stop a plot by these extremists to destroy London with an atomic bomb, which blows more or less harmlessly in the Thames. Greasy Gil returns briefly during this episode, sporting a metal cornet for an ear. As Horace Lorcquet buys control of Paradise Works, putting the brothers' jobs in jeopardy, they have a linguist, Bartleby, investigate the strange script in their parents' journal. He makes headway, but it is stolen by Phileas Fogg, recently arrived from his 80-day trip around the world. Confronting Fogg, they discover he's a sophisticated artificial man. 1-In Steampunk Atlantis, they manage to reach the airlock and the Nautilus despite Atlantean guards running after them with electrolasers. 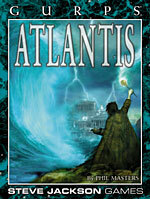 2-In Ancient Greek Atlantis, they manage to reach the docks and their ship despite Atlantean guards running after them with spears. 3-In Supers Atlantis, the water-breathing fugitives manage to reach the edge of the underwater city and their aquajet despite the scaly Atlanteans swimming after them with electrolasers.